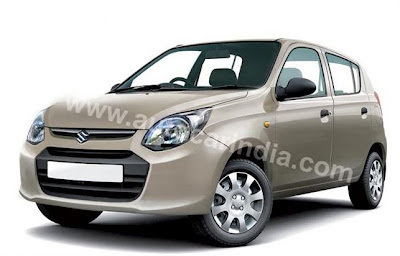 Carnation Auto Blog: Maruti Alto 800 - India's Best Selling Small Car Gets a Makeover! Maruti Alto 800 - India's Best Selling Small Car Gets a Makeover! After almost 13 years, one of India's most loved small cars the Alto get's a makeover. The all new Maruti Alto 800 is a car that is definitely going to do a Salman Khan in the Indian Auto Industry. Aiming at continuity and progress, the designers at Maruti have worked out a new Alto much like BMW or Mercedes designs their various refreshed cars...in continuation. It won't be incorrect to say that the 2nd generation Alto looks familiar, yet different. The compact size, high-placed headlights, among others are similar to the current model. But what is new are the aggressive looking two-part grille, petal-shaped headlamps, slightly flared wheel arches, and a hint of sporty look and feel. On the flip-side, the rather high ground clearance could be a deterrent. A car Alto's size doesn't really need such a massive ground clearance. Having the same wheelbase as the 1st generation Alto, the overall structure of the car has been changed to be stronger, but lighter. That's why the roof is thinner, though corrugated for more strength. Let's get to the cabin and quickly, because that's the single area of attention. New, modern looking, the dash looks cool. Plastic quality and shape of the center-console has been improved...and the new Alto has plenty of silver highlights inside the cabin to add a touch of glamor and pizzazz. One of the most interesting features is the horizontal bottle holder that's positioned before the gear lever and ensures that the driver never goes thirsty! Slimmer the seats may have become, but smaller too, leading to lack of leg space and comfort...thus the sore point too. The 2nd generation Alto 800 has plenty of big changes under the hood like new shorter skirt pistons, better compression ratio of the petrol engine thus increasing the torque 11% more, better response even at lower speeds, meaning overtaking just became easy, an improved and smoother gearbox plus plenty more. Riding the Maruti Alto 800 was a pleasure. It copes well with the Indian road conditions, and you don't feel the impact as much and that's a good thing from a car its size. So what's my verdict? Well, the 2nd generation Maruti Alto 800 is neither contemporary looking like its competitor - the Hyundai Eon - nor is it exciting. However, its a lot better than the older Alto and promises 15% more fuel efficiency @22.74kpl. Per rumors, the base, A/C version of this car is going to be priced around Rs. 3.15Lakh...so if nothing, its gonna ensure that the new Alto 800 continues to be a best-seller. Come 16th October, you can get yourself a new & improved Alto...so let the festivities begin! I wanted to write a quick note to express my thanks. I’m really impressed by a blog unique and perfectly chosen and organized! In terms of power and performance the new Alto 800 is reported splendid by Maruti Alto 800 reviews and auto experts as well as users.